Corelyzer is a collaborative electronic workbench for the analysis of cores of seabed and lake sediments, soil, hard rock and ice. It is a software tool from the Corewall project. The aim of Corelyzer is to increase the efficiency of scientific core analysis and description, and to make the dissemination of results quicker, for example between ship and shore, and within international collaborations. It also aims to increase linkages between research into different cored media like ice and sediments. 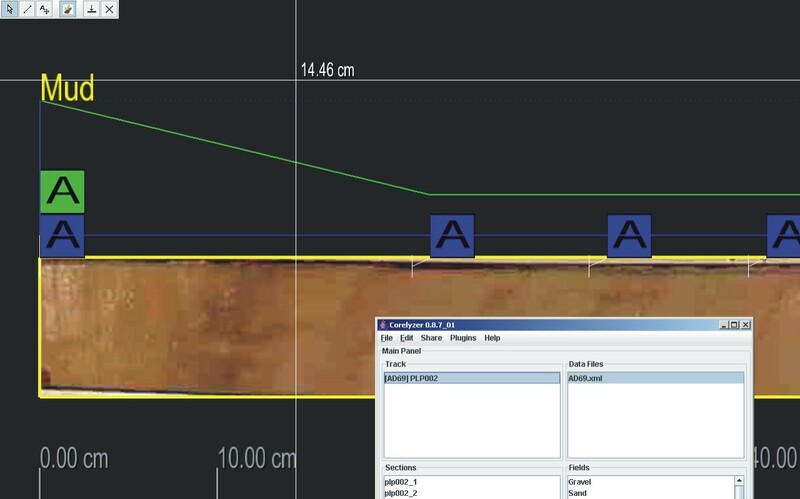 The stratigraphic and core image data content of dbSEABED is obviously a candidate for use in Corewall. This web page shows a use of dbSEABED data in Corelyzer. The chosen example is the TAMU Gulf of Mexico piston core dataset (Project Link). 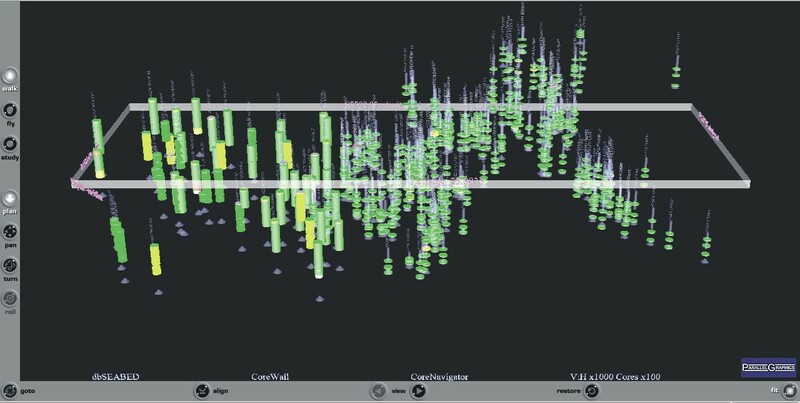 Stratigraphic and core data collections can be difficult to comprehend, given their 3D and sparse structure. The goal of CoreNavigator is to make core datasets more comprehensible and workable. A visual indexing of the TAMU dataset, access to the data with Corelyzer sessions is given through CoreNavigator (KML version) at KML Project. This is a product of dbSEABED processing of the TAMU core collection. 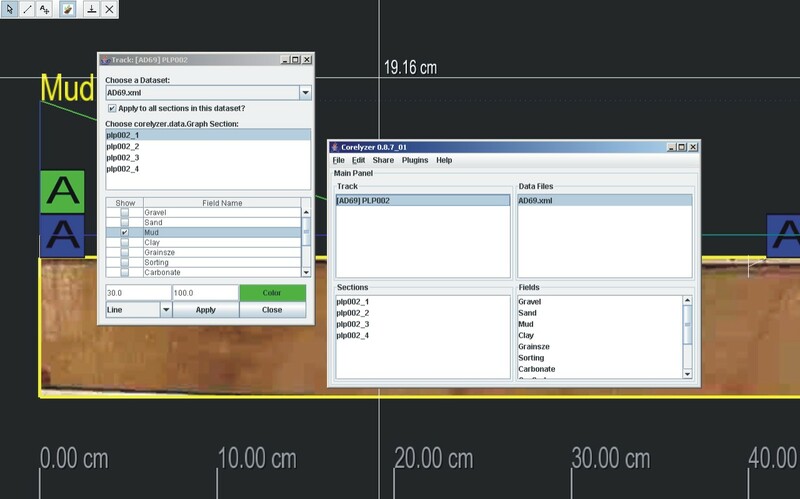 Begin with the Project URL which in most browsers will open a Google Earth (ver. 2+) display. The piston cores are shown projected up from the sea surface, with lengths proportional to recovery. Clicking on the placemark icon raises a text bubble, with options to view a SVG (Scalable Vector Graphic) log of the data which is available for the core, an HTM (web browser) page listing the data values, and a link to a CML (Corelyzer) file. Plugins will need to be installed on the user's local machine to view the SVG and start Corelyzer. Details of Corelyzer are available at a Wiki. Corelyzer installation sets CML as a MIME type, so opening a CML file starts Corelyzer. Corelyzer is best used in a multi-screen display (Example). The initial Corelyzer display will contain a core image and a sensor (i.e., measurement) track, with annotation (A) marks. In the display, green (point) annotations mark section tops, and the blue mark levels of string dbSEABED output data. Numeric outputs are rendered to the graphical Sensor Tracks. 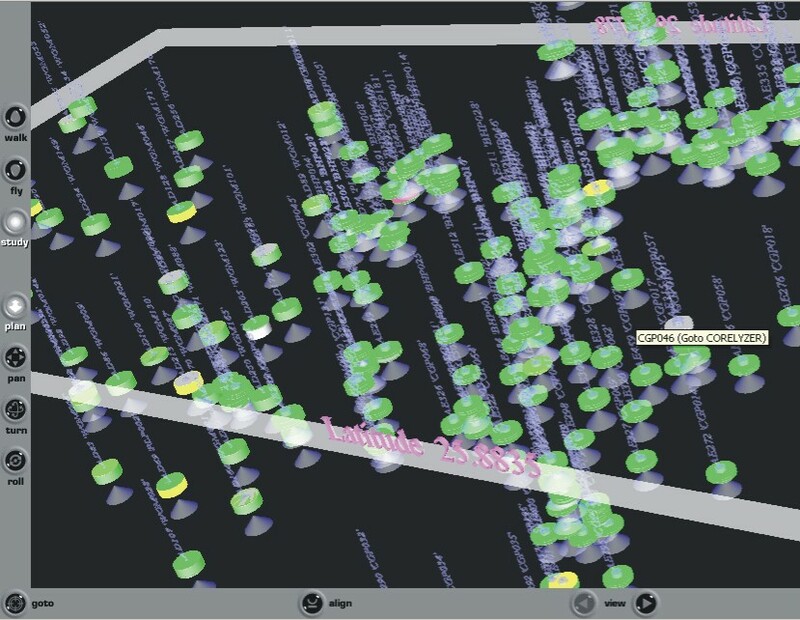 A VRML (Virtual Reality Modeling Language) CoreNavigator exists in addition to the KML. This fly-through presentation (Example 1, Example 2) is more suitable for local-machine comprehension and browsing of complex core datasets. Lithologies are represented and undividual core units can be interrogated by mouse and rollover. Cores are hung from the seabed, with various visual components representing recovery, penetration, and lithological units. 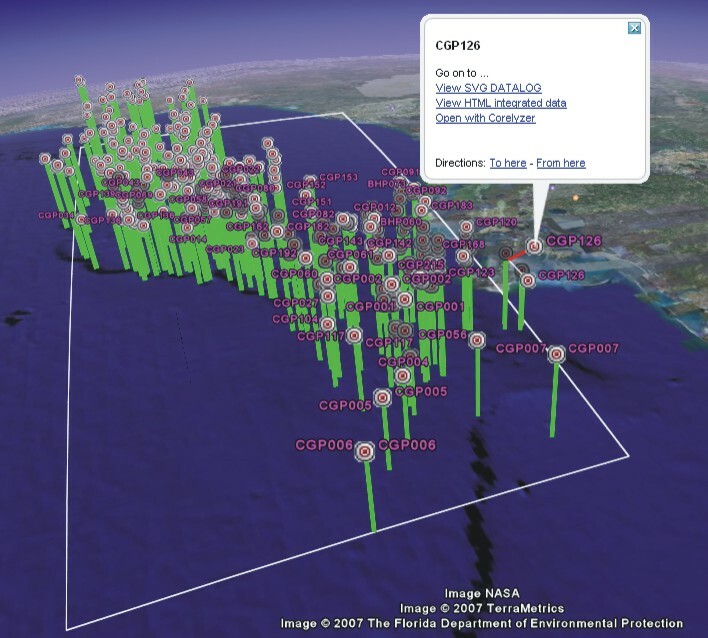 The VRML CoreNavigator of the TAMU piston core dataset may be obtained Here. 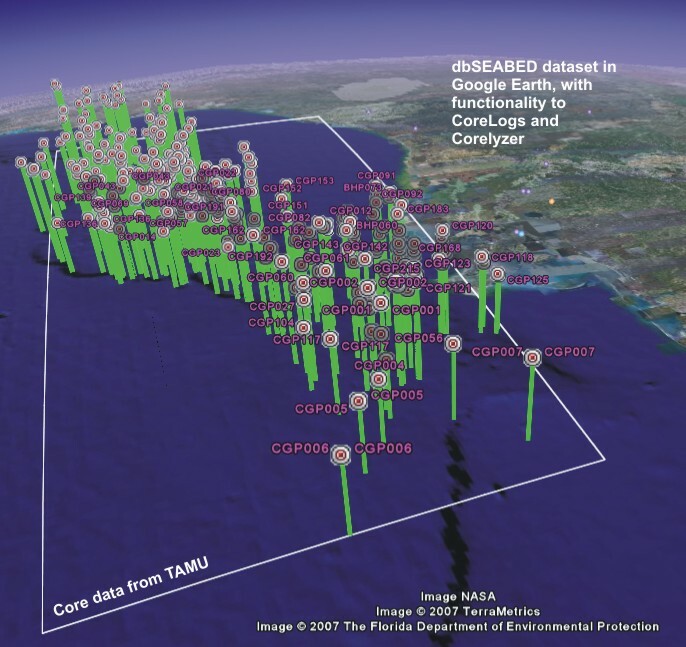 The Google Earth and Corelyzer projects were computed using programs in dbSEABED, and from the integrated dbSEABED data. Image strips for each core section were taken from photos of the sections in racks using dimensions compiled in EXCEL and image cutting in Imagemagick. The observational data, organized at sample resolution in GIS format (X, Y, Z, phase coordinates) was broken into subfiles, one per core. Only cores with >0.3m penetration were treated as cores. At this stage HTM, TXT data summaries were formed, and SVG graphical logs of the data were drawn. Potentially, the KML and CML generating programs used here could be applied to non-dbSEABED datasets. It is necessary to have well organized data and core images (strip or rack). Corewall is a project of the Universities of Minnesota2, Illinois at Chicago3, and Colorado1 and Columbia University. Corewall is a NSF and JOI funded project. dbSEABED is a collaborative project based at the University of Colorado. 1. Corelyzer Version 0.8.7.01 (or later) must be installed to operate all of CoreNavigator. 2. A plugin for SVG (Scalable Vector Graphics) is needed to operate all of CoreNavigator. Adobe SVG Viewer is suitable. 3. To display the VRML CoreNavigator a plugin will be needed. The Parallelgraphics Cortona is suitable. 4. 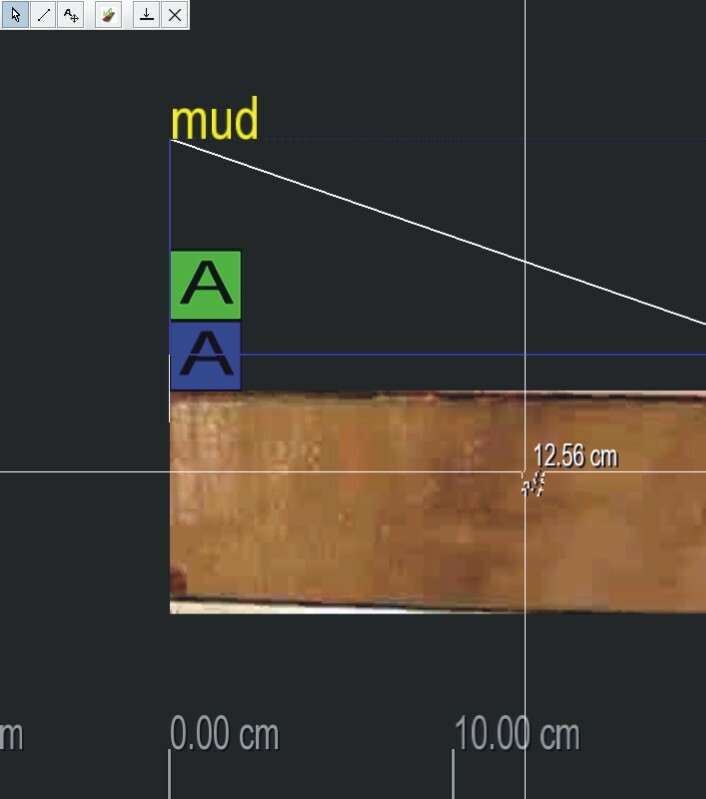 Note that the core photos for the TAMU dataset, which were taken as a rack of sections, have relatively poor resolution at the level of core section. 5. To generate the project, Windows XP operating system was used on INTEL machinery. 6. The Corelyzer CML and XML syntax is fully documented at This Link. 7. At start-up for Corelyzer session, only one sensor track is shown. To change the parameter which is plotted: (i) click the Corelyzer icon (third in top left) to start the tool window, (ii) right click the Data layer, (iii) draw a graph by working through the graph setup window (Screen Image; Final Display). 8. A problem viewing SVG datalogs from Google Earth can be worked around by setting "SeparateBrowserWindow"in the GE Options. 9. An intermittant problem with the sensor track failing to plot on startup of Corelyzer, is under investigation. It seems to appear in installations of Corelyzer that have a large cache collection. 10. Report difficulties and suggestions to: julian evl.uic.edu.